According a publication of Deckers (1973)1 the so-called Radboud-protocol provides a method to diagnose Down's syndrome on the basis of a few characteristics of the palms and soles. Research has indicated that the Radboud-protocol is very reliable in this matter. In 1943 Harold Cummins and Charles Midlo (another professor in microscopic anatomy) published a book titled: 'Finger prints, palms and soles'.2 This work is sometimes refered as 'the bible of the dermatoglyphics'. The developments on the insight regarding Down's syndrome have resulted in a large number of scientific publications during the early 60's. Quite some of these research programs focussed on studying the genetic cause of other diseases and syndromes through an analysis of the palmar dermatoglyphics. Many interesting results and observations have been reported since then, however the success-story on Down's syndrome was never excelled. During the 80's the research techniques on the dermatoglyphics were replaced by cyto-genetic techniques which provide the opportunity to study the genetic material directly. The 'karyotype diagram' is an illustrative example of the results which can be acquired through these modern cytogenetic techniques. 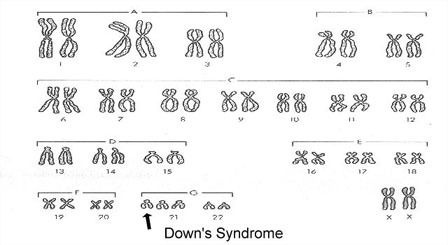 who has Down's syndrome (trisomy on chromosome 21). Nowadays the dermatoglyphics are still being used to study diseases and syndromes which are characterized by a complex etiology - usually this complex etiolgy is the result of influences of several genes or chromosomes combined with environmental influences. During the 90's the number of publications has been growing. And the content of several publications indicates that the study of dermatoglyphics will likely be applied in future psychiatry- and psychology research programs. The following of this mini-course will discuss many interesting and relevant insights which have been gathered in various branches of science. 1 - Deckers, J.M.F., e.a. (1973). Het gebruik van dermatoglyfen bij de diagnose van het syndroom van Down. Maandschrift Kindergeneeskunde, vol.41, 25, p.25-36. 2 - Cummins, H & Midlo, C. Finger prints, palms and soles: an introduction to dermatoglyphics. Philadelphia: Blackistion Co., 1943.